Archaeologists in Oman's southern Sinaw region have discovered a site that could reveal Indus Valley civilisation's influence on the Omani society 2,300 years ago, officials said. The tomb of a buried man with sword and daggers made of iron and steel was unearthed during an excavation and it has been scientifically proved that iron and steel arms were made in the Indus Valley civilisation first time ever, said Sultan Bensaif Al Bakri, director of Excavations and Archaeological Studies of the Ministry of Heritage and Culture Oman. This finding may prove the influence of the Indian civilisation on Oman during that period, he was quoted as saying by the Times of Oman. A 2,300-year-old underground chamber was found during rescue excavations 22km south of Sinaw. This was the burial chamber of the man in his 50's, buried along with his personal arms. Near his grave, two male and female camels were also buried. They were slaughtered after the death of the man, he said. According to the descriptions provided by the archaeologists, the sword and daggers were made of iron and steel which was first made in the Indian civilisation from where it spread to the neighbouring civilisations, including Oman, he said. The ministry will restore these arms and will display these models in the proposed national museum scheduled to open at the end of this year, he said. ''Another interesting paper was that of R.S. Bisht, read by Kenoyer, because unfortunately the Indian archaeologist was absent. It was about some particular hemispherical tumuli in the cemetery of Dholavira, which resemble some structures found in Bahrain (2200-2000 BC, or more precisely 2050-2000 BC) and also the historical Buddhist Stūpas! 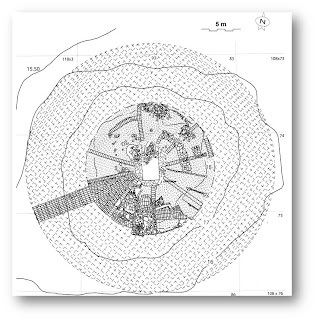 Particularly, Tumulus 1 .... has ten radial walls forming a kind of wheel-structure, which are found also in Bahrain, and in Stūpas (see below the Sanghol Stūpa). So, it seems that Bisht is going to assert that also the Stūpas have their roots in the Harappan civilization. About Bahrain, we can suppose that these tumuli are connected there with the merchants from Gujarat: 2200-2000 BC is the same period of the seals found in Bahrain of clear 'Indus' character. But for which kind of people where these tumuli used? Maybe for religious men, like the Buddhist Stūpas? 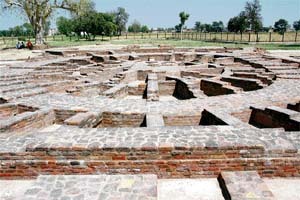 And are there other traces of Stūpas in India before the Buddhist period? According to Buddhist tradition, they were normally used before Buddha Gautama for the Pratyekabuddhas, who were wandering ascetics, and also Jains used to erect Stūpas.